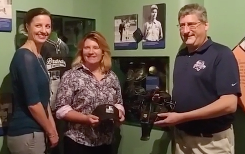 Jen Pawol donated some of her umpiring gear to the National Baseball Hall of Fame's Diamond Dreams exhibit, which celebrates women in baseball, after the Hall put in a request to "keep that exhibit as fresh as possible to remind people that this is an ongoing story," according to Vice President of Exhibition and Collections Erik Strohl. Pawol's hat and mask are going to the Hall. Specifically, the National Baseball Hall of Fame and Museum will feature Pawol's mask and a hat from her time at MLB Umpire Camp. The headgear will join several items from Amanda Clement (the first woman paid to officiate men's games in the early 1900s), Bernice Gera (the first woman to umpire Minor League Baseball), Pam Postema (first to Triple-A), and Ria Cortesio (most recent, prior to Pawol) to honor umpires. Pawol and Emma Charlesworth-Seiler are the only two women presently officiating in Minor League Baseball, and are the first such umpires since Cortesio's 2007 release. Both graduated from Vero Beach's MiLB Umpire Training Academy on scholarships from the MLB Umpire Camps program. Pawol recently completed her season in the Short-A New York-Penn League, while Charlesworth-Seiler worked the Rookie-level's Gulf Coast League.